YOU ARE MOVING DOWN A TRAIL AT THE WALK. THE SCENERY IS DRAWING your attention away from the trail, but your mount is paying attention to everything around him. You feel it as he starts to tense uphis head turns, his ears are up, and he is exploring, sensing something that you were not initially aware of. 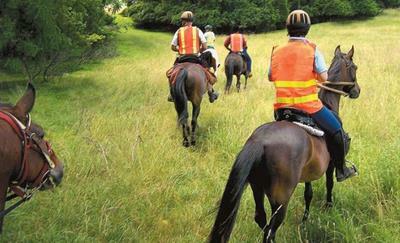 Now, you see what has attracted your horse�s attention, as do your teammates a hundred yards to either side. Their mounts have keyed in on the same item. As you dismount to verify your find, you reach for a radio, a map, and a first aid kit. After several hours in the saddle, and perhaps several days of effort, your horse has found the object of your search, a person alone in the woods, at risk of hypothermia, dehydration, or worse. 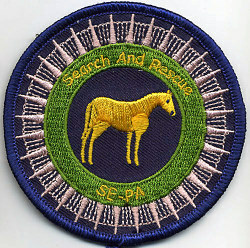 This may be a once-in-a-lifetime event, but as a mounted search and rescue rider, you will likely invest years of training to accomplish your goal of finding someone who needs your help! a 100% Volunteer organization with no paid members. like to know more about us.